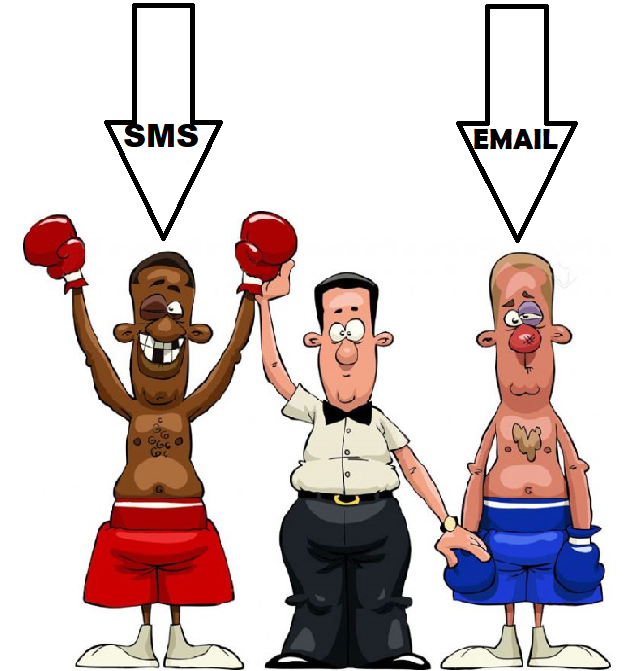 SMS vs Email: If you are new to the cyber era, then fasten up your seat belt. Business organizations acknowledge the fact that customers are the biggest asset for them. As communication gets lightning quick in today’s world, both SMS & Email are tussling ceaselessly for the throne. It really gets frustrating for companies to decipher which marketing channel to go with. Most of the digital media or the internet suggests that SMS is more effective than Email. Interaction is the holy grail in the digital forefront. An SMS offers instant connectivity in comparison to an email. Email messages may land into a recipient’s junk folder which will obstruct communication. An SMS on the other side ensures that all messages will land in the recipient’s inbox and therefore, it is confirmed that interaction will take place. SMS is the only platform that possesses connectivity seamlessly. Nothing fascinates people more than to remain connected to the global village. Global business organizations spend around half of their annual budget in high tech marketing. Less investment and more turnover are the modern day mantra for businesses. So, this makes pricing a decisive factor. If we compare the money we require to launch an Email campaign against an SMS campaign, then you will be left awestruck that SMS campaigns may cost you more. In contrast, an Email campaign is cheaper and requires less amount of investment. However, the return on investment decides which channel is more beneficial to the campaigner’s cause. Reports clearly speak that only 1 out 5 recipients will open and read an Email. But an SMS is likely to be read by 4 out 5 recipients. Email marketing not only requires a fair amount of investment, but it demands more expenditures on designing and creativity that you need to bear. SMS messages contain limited information, but only relevant one. Email messages carry long and irrelevant information which adds a great deal to the recipient’s boredom. Comparison between SMS & Email is analogous to quality vs quantity. SMS messages are quality text messages and email messages are more quantitative. According to the universal standards, an SMS is limited to 160 characters. Again, it is important to note that SMS messaging is all about exclusivity. The lesser you speak, the better are the chances for you to hold public attention. People really don’t cherish long conversations on emails. No surprises that our email accounts are flooded with spam messages. Research shows that SMS messages have an open rate of approximately 94%, making it the most for any marketing channel till date. Email messaging is without a doubt, an old school practice. Hardly 10-15% emails are opened and most of them are spam messages (phishing). Talking about the response rate for both marketing channels, SMS has again dispatched email due to its high response rate. Statistics suggest that Email has a low response rate of around 6% only. While all SMS messages are read within minutes once delivered. Constant internet connectivity is something that cannot be achieved. SMS messaging is exempted from the dependency of the internet. On the contrary, for emails, internet connectivity becomes mandatory. SMS messages are sent through satellite network carriers, which enhances the deliverability rate as well. But email messages are vulnerable to malware attacks and often carry misleading information. 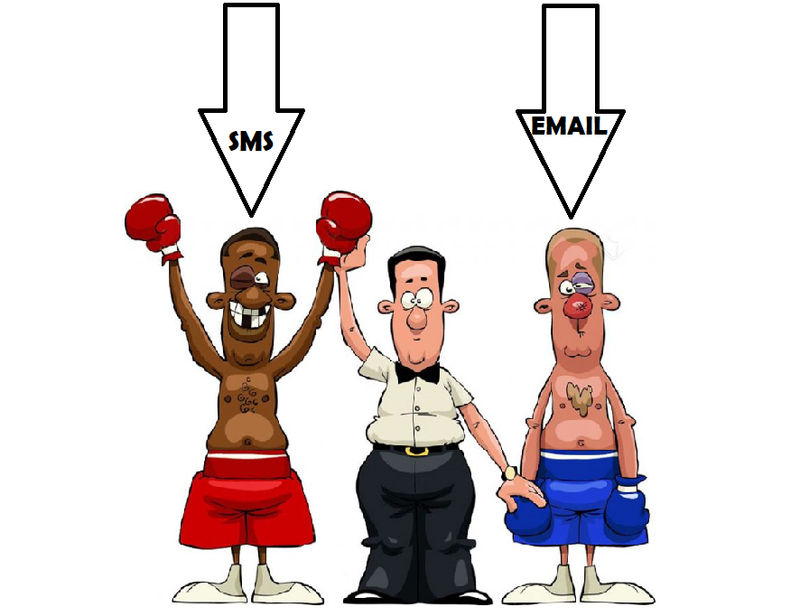 In this situation, choosing SMS vs Email looks like a – sane decision. All seasoned campaigners and beginners know that spamming is an abominable practice. Well, no platform can ever be spam free. However, we can still distinguish which platform is less prone to spamming. Email messages as discussed earlier are loaded with spam. Approximately 85% of emails fall under the category of spamming or phishing. Comparatively, SMS messages are less threatening in terms of spamming. There are worldwide network carriers who can track and monitor all text messages being sent. For SMS messages, spamming or phishing is regarded to be a forbidden exercise. To sum up, we can bluntly say that spamming is synonymous with email. We have deliberately placed this section at the last because opt-in is the most initial step in both SMS & email marketing. The Opt-in feature is of paramount importance. Both Email & SMS conform to the pre-defined rules of the FCC Federal Communication Commission & MMA Mobile Marketing Association. SMS opt-ins allow marketers to attain prior consent of the recipients before sending them any text message. But for email, opt-in is often treated as a secondary unit. Email messaging tends to violate the governing rules and regulations by sending unsolicited messages to unknown recipients. However, SMS messaging is credible, an authorized channel in the sense that it upholds all the standards set forth by the regulatory bodies. The buzz related to SMS superseding email is a genuine one. Whatever has been discussed above adds more to the body of knowledge and signifies that SMS is certainly more effective than email – hands down. Today, businesses are embellishing themselves with the channel of SMS text messaging. In most cases, it has been explicitly observed that email messaging has been thrown into the lake of fire due to the advent of SMS. The bottom line is that SMS is the most potent arsenal for all tech-savvy marketers across the globe. Copyright © 2019 The Texting.com All rights reserved.